We've all wished we had more money than we have but according to T. Harv Eker, "We all have a personal money blueprint ingrained in our subconscious minds...", so if we're not meant to have money, we're more than likely not going to be rich. But, he says, "If you think like rich people think, and do what rich people do, chances are you'll get rich, too". He says we can reset our blueprint. Using these cards as motivational tools, reading and repeating them often, your mind will supposedly think about them more. Thoughts like "If you want to get rich, focus on making, keeping, and investing your money. If you want to be poor, focus on spending your money", and "Rich people take advice from people who are richer than they are. Poor people take advice from their friends, who are just as broke as they are". I think I'll choose the most poignant cards, frame them, and mount them on a wall where I can see them, read them, and reinforce their meanings. 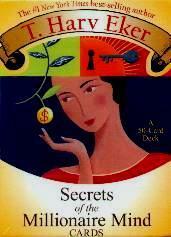 T. Harv Eker is the author of Secrets of the Millionaire Mind and these cards are based on that book. Visit Mr. Eker's website at www.secretsofthemillionairemind.com. Conclusion - Very inspiring. These cards will make great gifts.